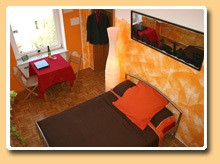 The guests rooms are located on Ostendstrasse in 60314 Frankfurt am Main, Germany. Frankfurt Eastend is so centrally situated, that one can practically call it the city centre. Frankfurter Hauptbahnhof (main station) is about 10 minutes with the S-Bahn (tram) away. Even the airport can be easily reached in 20 minutes, without having to change the train. The S-Bahn leaves every 5 minutes to Frankfurter Messe (Exhibition Centre). The direct journey takes about 10 minutes. The S-Bahn station Ostendstrasse is practically on the doorstep, but don’t worry, the S-Bahn travels solely underground within the city and you won’t even notice it’s there! Almost all sites are reachable within walking distance from the apartment. The apartment with 2 guest rooms is on the 3rd floor of a traditional-style building in one of the small, quiet pedestrian zones (it’s an older building, without a lift). The rooms are perfectly suited for a small group or a family. The southerly facing room with a view to the courtyard is about 16 m² in size. The double bed (140 x 200 cm) provides space for 2 adults. The modernly formed room has a TV, WiFi internet and a small dresser with a clothing stand. 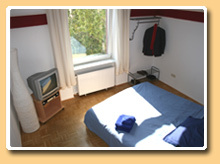 The room is facing a small pedestrian zone and to the skyline "Mainhatten" to the north and it is about 24m² in size. The double bed (140 x 200 cm) provides space for 2 adults. 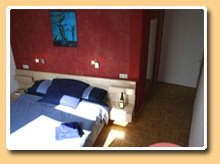 Additionaly, there is a large couch that can be converted into a double bed for two persons. The room has a TV, internet access via WLAN and of course a shelf with a clothing stand. 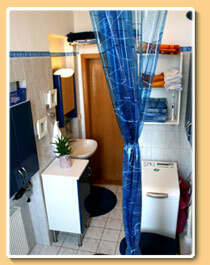 There is a bathtub with shower, as well as a washing machine and a clothing stand which you may use. 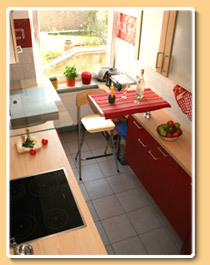 The kitchen is equipped with all the utensils and equipment that a hobby chef needs. 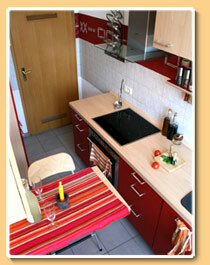 Who doesn’t want to cook or eat alone, is welcome to cook along or simply enjoy a meal together with the hosts. Cuisines from all over the world, as well as new and different tastes are always a treat for them. This young, international couple with baby is looking forward to meeting you. They speak German, Spanish, English and all other languages with the help of as many hand and foot gestures as needed. If you’re interested in a city tour in Frankfurt, the hosts (if available) would love to be your hobby tourist guides and show you around the city, through the eyes of a Frankfurter. To arrive at the Frankfurter pedestrian zone and shopping street, one can either ride 1 stop with the S-Bahn or take a comfortable 15 minute walk. 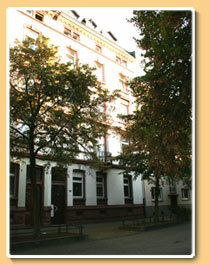 Even the Frankfurter Römer (definitely one of the top attractions in Frankfurt) is just a 20 minute walk away. Alternatively, the Ebbelwei-Express, which goes passed the main attractions, stops nearby. A visit to the Frankfurter Zoo or a relaxing stroll along the Main River is also less than 5 minutes away. For a night out, head to Hauptwache in less than 5 minutes and go to Fressgass. For those wanting to wander around or go for a drink, go along Frankfurter Anlagenring to Berger Strasse. For a more touristy feel, head directly to Alt-Sachsenhausen. Either in 4 minutes with the tram or a 15 minute walk away. Upon request, breakfast and dinner can be booked as well. Washing and ironing are possible if requested. A child up to 3 years old, sharing the parent’s bed, can stay free of charge. The room is available from 6pm on the day of arrival. Pets: out of respect for guests with animal allergies, your pets will need to stay at home or be kept in a different accommodation. Smoking: out of health reasons, smoking is not allowed in the apartment. Parking: finding a parking space can be tedious, so be prepared to spend some time searching or walking a few minutes to your car. City centre = public transport. The host will gladly show you the right places to park.